Business is increasingly being called upon to demonstrate 'what more' it does for society. In a climate in which companies are frequently painted as social outlaws who need fundamentally to change their ways, this determined if ill-founded attack has been met for the most part by appeasement in corporate circles. This acquiescence has given rise to the burgeoning 'corporate social responsibility' industry. Why is business going along with this? The current conversation about business and society is dominated by the perspectives and interests of those who live in rich western countries. Many activists, analysts and others do not grasp the realities of poverty and the hard choices of development outside the industrialised world. As a result, the debate about business, 'responsibility' and corporate involvement in development is distorted, with few voices from developing countries being heard and the positive contribution of 'just doing business' almost completely unacknowledged. 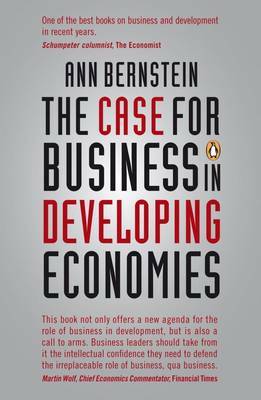 In this book, Ann Bernstein argues that a new approach and a new discourse are required to cut through an increasingly flawed conversation with potentially dangerous consequences for the poor and for developing countries in particular. Informed by many years of living, working, and championing the role of business in growth and development in a middle-income developing country, Bernstein urges business not to let the attacks stand unchallenged. It must find the confidence and strategic vision to stop apologising, develop its own public agenda, and start propagating the phenomenal benefits of competitive capitalism for the less developed countries of the world.